Document Signed “Wm. M. Wherry” 1pp. 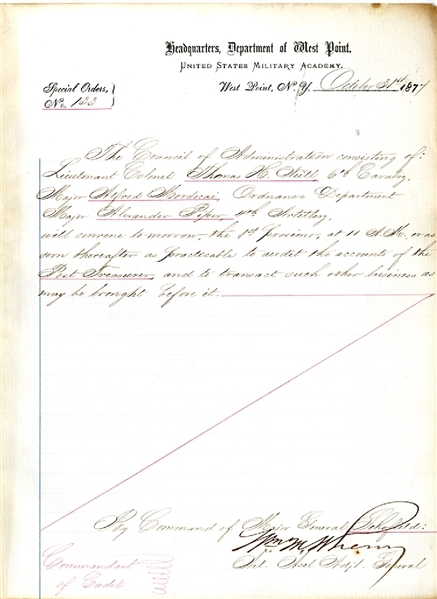 quarto, October 31, 1877, West Point, New York, pertaining to an audit of the Post Treasurer, and lists “Major Aldred Mordecai” as one of the members. Fine condition. Alfred Mordecai (1840-1920) After graduation from West Point in 1861, he enlisted in the Civil War on 07 February 1861 in Goshen, New York, joining the Union Army of Northeastern Virginia. He was less sensitive to his Southern heritage than his father, Major Alfred Sr. He became a Jewish Civil War hero. He received high commendation for his conduct at the Battle of Bull Run by the order of the Department of War. Alfred served as Chief Ordnance Officer in several Union regiments including Company B, 8th New York Cavalry. He received a promotion of Major on Sept 7, 1863 and he became a Lieut. Colonel on March 13, 1865. In 1865, he was appointed instructor of ordnance and gunnery at the Military Academy. Colonel Mordecai became the Superintendent and Commandant of the Springfield Armory from 1892 to 1895. When he left the Army, he was promoted to Brigadier General.